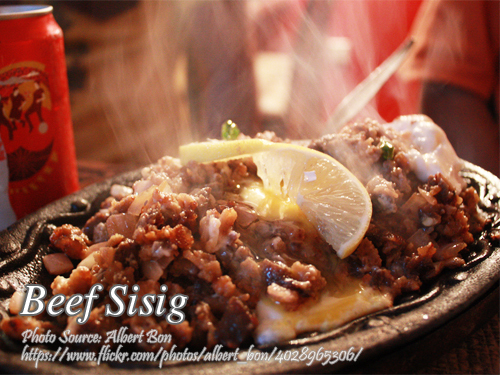 Beef sisig is a variation of the famous pork sisig. Unlike the pork sisig that use pig’s head as the main ingredient, the beef sisig use beef tenderloin. The procedure is almost the same as the original sisig that uses pork. You have to fry the meat first then chop it in to small pieces. Make a sauce from the marinade by sauteing onion, garlic, chili and the marinade. Simmer for a few minutes and season with salt and pepper and add beef broth cubes. Then add the fried meat. Put some mayonnaise and lemon juice. To cook beef sisig; Slice the beef into strips about half an inch thick. Marinate in soy sauce and vinegar for about one hour. Then fry the marinated beef until golden brown and set aside. Boil the beef or chicken liver and fry it the same as you did in the beef strips. Set aside. Slice the fried livers into medium size cubes. Set aside. In a wok or a heavy skillet, heat about 1 tablespoon oil and saute garlic and onion, chili and bell pepper. Then pour about 1/2 cup of the soy sauce and vinegar mixture from the beef marinade. Simmer for a few minutes then add the pepper and beef broth cube. Add salt according to your desired taste. Then pour it on the fried beef strips and liver. Put the mayonnaise and some lemon juice to give a little sourness and mix until all the ingredients are well coated with mayo. Hi Lilibeth, I’m happy you liked this beef sisig recipe!